This is a very pretty watch great quality, too fancy for work. 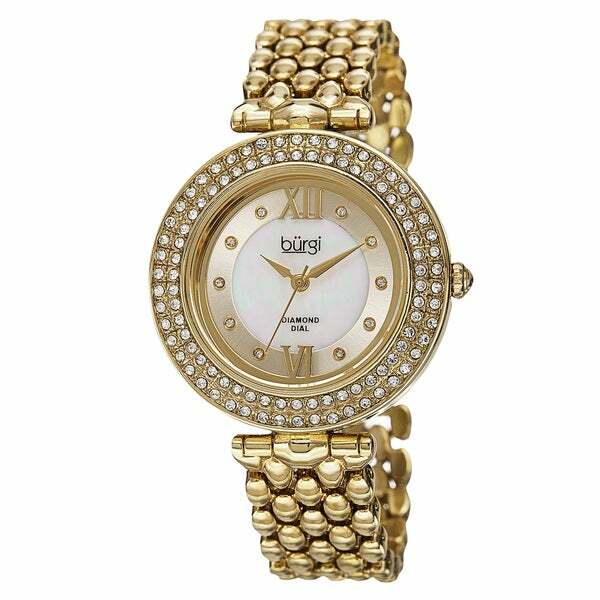 This Burgi women's watch is powered by a Swiss quartz movement. It features sparkling diamond markers on the dial and dazzling crystals on the bezel. The elegant and stylish design will compliment any outfit for every occasion. This watch is very beautiful. The photos on the website really don't do it justice. It looks very expensive, yet it is very affordable. The only thing I need to do is to have the bracelet shortened. There are two removable links, but it is still very long. (I have very small wrists.) The color is quite stunning, and the crystals are beautiful. I would recommend it highly. Beautiful Gold Bling Watch ! My package arrived this evening as promised and I am very very pleased with this purchase. This is a great watch of excellent quality. When I think of all the cheap plastic watches I have had over the years when I could have been wearing something this nice....oh well now I know better. Absolutely stunning. I got the silver gold mixed tone one and it is glamorous. Because it’s loose fitting and I have big wrists (struggle w most watches and bracelets) it looks feels like a nice sparkly bracelet as well. Bürgi is great quality. Details at *** for hundreds of Dollars. Sparkly gold, crystals, diamond bracelet watch. Love this watch! It is a fun piece of jewelry. It is fun to wear because it is definetly bling but not gaudy. The dial is a great size with diamonds for the numbers. I wanted the larger dial bracelet style and it is exactly what I wanted. I hate taking it off at night. This watch is beautiful and has plenty of bling! It comes with plenty of room for large wrists, and a jeweler can take links out to make it smaller for about 20 bucks. It is keeping time beautifully. It is easy to read the time with the white background, and the gold is very bright and shiny. If you like gold you will love this watch. I ordered this for my mom... she absolutely loved the watch. The bracelet comes with three adjustable lops, to easily resize the strap. Great value for money. Although the dial looked a little big, but it surely is the fine piece to be worn solely, substituting any other jewelry or accessory to dazzle. This is pretty in gold tone but not in silver. Bracelett Runs large . Received this watch for my birthday. I removed the added links easily for a proper fit. A gorgeous watch I wear daily and I get so many compliments! I love the look and feel of this watch and especially the fact that the face is easy to read. I like it so much I ordered another one in the silver tone. Love the modern and rich design of the Burgi. My wedding ring is European rose gold and it matches perfectly! Gorgeous. Had so many compliments on this watch first day I wore it. It's simple but gets noticed! Great watch for both young and middle aged. I bought this for my mother and she really liked it. It looked great on my girlfriend as well when she tried it. This was a Christmas present and the price was very reasonable as well. I definitely did a great choice. I love the watch. It is very pretty and keeps accurate time. The user information provided gives no advice on how to tighten the bracelet watch band, so it is too lose for my taste - but I wear it and receive lots of compliments on it. Not only was this a great piced watch, but it is a great watch. It was all that I anticipated that it would be. I absolutely love this watch. Bought as a gift for my mother. She is amazed with the watch. Highest quality and well worth the purchase. Great product and fast service! Love it! I have enjoyed wearing this watch and would like to find another like it. Very comfortable and the right size for my arm. It is dressy enough for any occasion. As described but did not get a free bangle. This watch has a timeless elegance to it.Very fashionable.Would definitely recommend. This is a statement watch. It is bold and large. Not for the faint of heart. Just my style. I matched it to certain other statement pieces of jewelry I own. Love the look. Not my day- to- day watch, but a special occasion watch. Very bright, very shiny. Pretty dial. This is a very nice watch. I didn't like that the band turned colors. After one month of normal wear. I only wore it to work. I would but this watch over and over again. It is very pleasing to the eyes. "what does '' 3 settings'' to adjust band mean???" "anyway to adjust bracelet band... I have sm wrists.. saw comments no instructions or way to make smaller, and to loose on wrists.. is this true??? how do i know when you reply???? do u send reply to e-mail???" "What is the guarantee? Is it waterproof? Is the crystal scratch resistant?" Limited 2 yrs warranty, waterproof but not recommended to go swimming and doesn't say if crystal is scratch resistant. I love the watch. It has 3 settings for length of band.